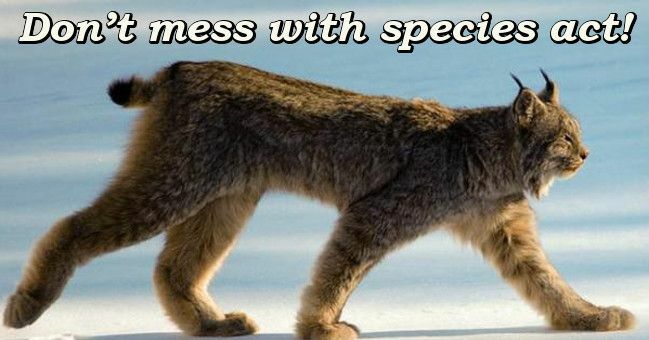 America's successful and beloved Endangered Species Act (ESA) now is under threat of extinction. Regulatory changes recently proposed by the Trump administration's U.S. Fish and Wildlife Service (FWS) and National Marine Fisheries Service (NMFS) would make it easier to de-list species and harder to add new ones. The proposed changes would allow crucial habitat to be decimated by extractive industries such as logging, mining, ranching and fossil fuel extraction. We must stop this attack on endangered species and the ecosystems that support them. Public comments are open until Sept. 24, 2018. Add your voice now. Weakening the ESA as proposed would significantly reduce the role science plays in classifying "endangered" and "threatened" species. The changes also would allow lawmakers to place economic considerations above the actual needs of any particular species. These revisions move would effectively cut off the legs that have carried the ESA to becoming one of our most powerful tools for preserving the environment. It is because the ESA stands upon a rigorous scientific foundation that it has, for the past 45 years, successfully prevented the extinction of 99 percent of the species under its protection, including the bald eagle, gray wolf and humpback whale. For years special interest groups have lobbied to weaken the ESA. Now, with Trump in the White House, Ryan Zinke at the reins of the Interior Dept., and anti-conservation crusader Rep. Rob Bishop (R-UT) rallying the far right to "repeal and replace" the act itself, this popular and successful conservation law is in grave danger. We must save the Endangered Species Act. Please speak up now in defense of preserving this landmark legislation. When it was enacted in 1973, the idea to protect and preserve the heritage of our land and the diverse wildlife we share it with enjoyed strong bipartisan support. The legislation passed the House 390-12 and moved through the Senate on a unanimous vote. Upon signing it into law then-President Richard Nixon stated, "Nothing is more priceless and more worthy of preservation than the rich array of animal life with which our country has been blessed." Today the Endangered Species Act continues to command bipartisan support among voters. A recent poll showed that 90 percent of voters across all demographic groups were supportive of the ESA. The devastating changes now sought would provide short-term profits to only a few, while causing a devastating and permanent loss to many — humans and non-humans alike. General information on the Endangered Species Act of 1973. The ESA has been attacked by industry and right-wing politicians for decades. Click here. The threats this time seem more ominous. Click here. These are species protected by the ESA, and saved (so far) by it.